We ran into rough weather on Sunday night, with the wind gusting at more than 40 knots and NOAA (the US National Oceanic and Atmospheric Administration) reporting average seven-metre swells in our area. Those conditions forced us to pause our passage and turn the ship into the weather for several hours. But although conditions were challenging for those aboard, our tying down of equipment proved secure, and we were able to resume course for the Mid-Atlantic Ridge once the seas abated. Since then we have made steady progress in calmer seas, and expect to arrive over the Mid-Atlantic Ridge on Wednesday afternoon. 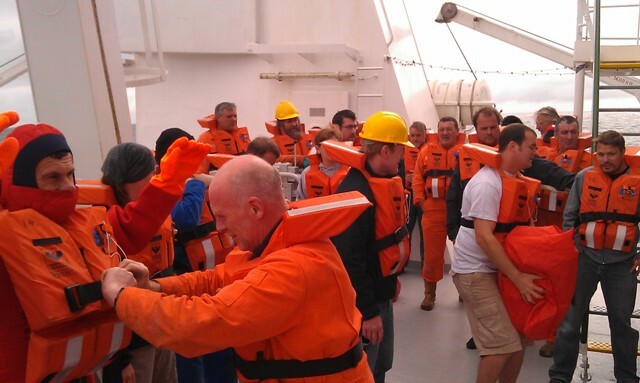 Once the seas had calmed, we also held a routine emergency drill. Everyone reported to their “muster point” in response to the ship’s alarm system, and practised donning lifejackets and immersion suits. As we get closer to the Mid-Atlantic Ridge, we’ve also been fine-tuning our procedures for collecting data and samples once we arrive. This has involved meetings and discussions with members of the team who operate the ROV, and among members of the science team who will be sharing samples. These preparations have created an air of quiet expectation in the labs aboard the ship, as the Mid-Atlantic Ridge draws nearer.